Lapel Pin: "The Call to Divine Victimhood". Lapel Pin: The Call to Divine Victimhood. The largest flame represents the Flame of Divine Love, the next size is the Flame of Holy Love, and the smallest flame is the victim soul. 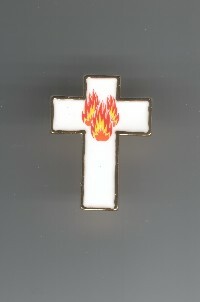 White cross on goldtone with flames in light and dark orange and yellow. Size: 3/4 x 1 in.